It's 2.00am and I'm exhausted but I need to tell you about this film I just saw at the Tribeca Film Festival. I was excited about Robin Williams returning to television with 'The Crazy Ones', but could never quite get into that show. 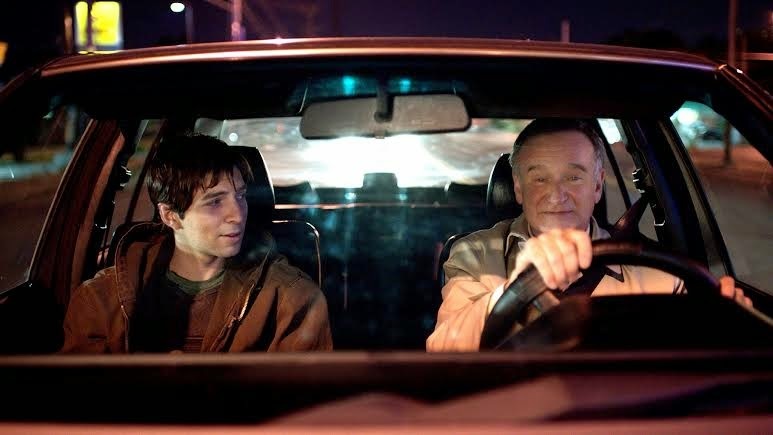 And the world is currently buzzing about the prospect of a 'Mrs Doubtfire' sequel, but if you really want to see Robin Williams excel, you need to see him in 'Boulevard'. Dito Montiel's debut feature, 'A Guide to Recognizing Your Saints' was about youthful energy, exuberance and pain. 'Boulevard' feels like what comes years later, when you wake up 60 years old and realise you've closed your eyes for all of your life. Robin Williams is so heartbreaking in this movie. In real life he's manic and hilarious, but he's also a very deep guy who's had many troubles. It's in all too rare roles like this where his complexity really shines. And not through any big acting moments. It's all in the subtlety. It's all in his eyes. And Montiel is wise enough as a director to just get out of the way - to let his actors steal the scenes. The first person I ever interviewed on this blog was Jake Pushinsky, who has edited all of Montiel's movies. When we first got in touch he'd only cut a handful of movies, now he's a seasoned pro and this is some of his best work yet. I feel like making movies is much like managing a sports team. It's tempting to go out and sign new people every year, but the best results come when you find the players who suit your system, and build a team around them. Robin Williams excels in this because of the directing and because of the editing. And the music - wow. The music is hypnotic. It draws you into the world of the movie to the point where you feel you're sitting in the room with the actors. Credit again to more of the director's long term collaborators, David Wittman and Jimmy Haun. Wittman's music in particular I have always loved -- he creates these melancholy, tender pieces, that permeate through the most important scenes in all of Dito's projects. KATHY BAKER - You could be forgiven for thinking she's just sleepwalking through this film. But then towards the end, during a confrontation with Nolan (Williams) she let's it all out. But not in some over-the-top-way. When I say she let's it all out; I'm overstating it, because she also holds a lot in. We see a woman who has made compromises, and who has secrets of her own. Baker nails it. ROBERTO AGUIRE - Had never heard of him before. Plays one the main characters in the movie. We always feel there's more to him and his background than is being let on. Credit to Aguire for his convincing turn as the difficult and troubled Leo. BOB ODENKIRK - Quietly hilarious throughout. Full of subtlety. (I realise I'm overusing the word subtlety in this review, but that's just how it's going to have to be). ELEONORE HENDRICKS - Another example of the filmmaker's loyalty. He's cast Hendricks time and again; and the difference between her in 'Saints' and her in 'Boulevard' shows her acting talent. ANGELA MESSINA - Great production design. Helps Robin Williams's character come to life among the drudgery of his bland home and cramped workspace. DOUGLAS SOESBE - The writer. Crafted a great story; unusual and deceptively slow-paced. A screenwriter whose tale is perfectly suited to the style of the director. I have purposefully not said much about the plot of the movie, because I'd love it if you were as surprised as I was. What should I tell you? Nolan Mack (Robin Williams) is a regular guy, with a regular job. He doesn't have a breakdown or anything. He just gets offered a promotion, and his wife wants to go on a cruise. As the prospect of getting even more trapped in a life that doesn't resonate with who he is dawns, mixed with his Dad being close to death; he faces up to the difficult truth of who he really is. This is a great movie that fulfills the promise Dito Montiel showed with 'A Guide to Recognizing Your Saints'. That movie was bursting with overt creativity and an onslaught of ideas. 'Boulevard' is more restrained, refined even. This is Dito Montiel but it's him ten years later. My favourite scene is a scene between Robin Williams and his father. It's a beautifully crafted scene that brings together all the things I've been talking about; delicate editing, nuanced music and the best acting Williams has done in decades. I can't tell you the content of the scene, because it would ruin the power of it when you see it. I'll refer to it as the 'beach' scene and those who have seen it will know what I'm talking about. Interestingly this scene was cut out of the movie until two weeks before the release. I talked to Douglas Soesbe, the writer; and he said it was partly his fault. The scene as written appeared earlier in the film, which took out a lot of the dramatic tension. For that reason, it was cut out -- only to reappear finally, later on in the edit. I'm glad it's back in, because the scene is incredibly moving. How well 'Boulevard' will do when released, only time will tell. I think it's more accessible than many of Montiel's recent films, including 'Son Of No-One' which was seen by absolutely no-one (but I loved it). Dito is a real artist and I'm glad that he's in the system making films, and with big talent like Robin Williams, too. Long may it continue, I can't wait to see what's next. A well written and insightful review. The one missing link is a mention of cinematographer Chung-hoon Chung, whose brilliantly inconspicuous lighting and composition (along with some sublime and subtle camera moves) are vital to the intimacy of this beautifully crafted film. Totally agree Bob! Not sure why I didn't mention that - can only blame the fact I was exhausted and writing it in the middle of the night, but Chung-Hoon definitely deserves big praise! I've been searching for reviews on this film and seeing only good things. I'm puzzled as to why it hasn't found a US distributor yet. (At least I don't think it has.) Since it looks like it'll be the last live action film of Robin's to release, I really hope it is as good as you and others have said.